Mark & Patricia: In 2007 we traded living in downtown Toronto, for living in a truly remarkable place – on Anarchist Mountain. We had been interested in moving to western Canada for some time, and had looked at properties all though the Okanagan Valley, and in other parts of British Columbia. The further south we came in the Okanagan Valley, the better we liked the area. When we got to Osoyoos, we knew that our journey would end here and that this was the place for us. Osoyoos itself is a great little village with friendly and helpful merchants and service providers. We settled in on a 5 acre property on Anarchist Mountain, overlooking the valley. To say that the view from our house is “special” is easy to defend. On clear days we can see 20 – 30 km in all directions. Sitting at 2,000 feet above the valley bottom, with the Cascade Mountains in the background to the west, this is a truly beautiful place. We regularly have visitors such as deer, moose, eagles, hawks, owls, jays, tons of small birds and lots of other fascinating “critters” that just wander by and enhance the serenity of living here. The sun rises and sunsets on Anarchist Mountain are amazing, especially in the winter months when we often are in sunshine above the layer of clouds that drapes the valley floor. Perhaps the most wonderful part of living here is the people that are our neighbours. Folks here have proven to be open, friendly and from every corner of the world with amazing diversity bringing interesting people to this place. Neighbours help each other here, and there are regular parties, BBQ’s, nature lectures from experts, moonlight snow shoe treks, music events, horse enthusiasts, and picnics that happen throughout the year, all bringing our little community together. Many folks work remotely from Anarchist Mountain, because the excellent internet service here which makes that possible. Others still work in local towns or even commute to Alberta on rotations that seem to work out well. Indeed, we feel that this is the Best Place on Earth to live. Bernard & Patti: We moved to Anarchist Mountain from Guelph, Ontario in January, 2013 after a long search for the right house in the perfect environment. We visited BC several times in the past and knew that it was right for us. We checked out the Island, Vancouver and many places in the Okanogan but we were stuck on Osoyoos. It is so unique and spectacular when it comes to climate and ecosystems. Living in Osoyoos provides us with a launching point for many, many other places to see and explore within Western Canada. We bought a beautiful home on Anarchist Mountain. We drove out to our new home in January, 2013. We have not looked back and have already checked out some of the amazing sites there are to see in this area. Next summer we plan to pan for gold in the Tulameen River and also go tubing near Rock Creek. You can launch your little floating device and drift slowly for miles down an amazing shallow river and end up at a restaurant/pub. While we originally thought we wanted to live in town, we are pleased that we found this mountain home. The mountain air is always fresh, it’s nice and cool on summer evenings, the wildlife is abundant and the neighbours are great friends but respect our privacy. Life’s good on the mountain! Marci & Bob: 10 years ago, Bob and I visited Anarchist Mountain after reading a news article in the Edmonton Journal about Osoyoos. Simply put, we bought an acreage property here immediately. My parents accompanied us on that trip, and unbeknownst to us, they came back a month later and bought a condominium. As we were busy with our businesses and family, we could not move here for another 8 years. Every summer, we would visit my parents and our property, dreaming of our new home. It was always very hard to drive back down that mountain and return to Alberta! After a particularly brutal winter, we knew it was time to build our home in BC. We found a wonderful home builder, Roland at Harmony Homes, who took care of everything while we went about the process of relocation. 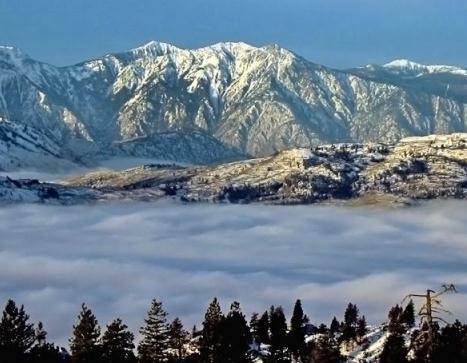 Friends and family from Alberta say that visiting Anarchist Mountain and the Town of Osoyoos is like visiting another country. We agree things are unique here. We looked for a quieter, more peaceful place to live and retire with like minded people, and we found it. When we wake up to the mountain scenery and its wildlife, we pinch ourselves and agree that we live in paradise. And we haven’t even retired yet!